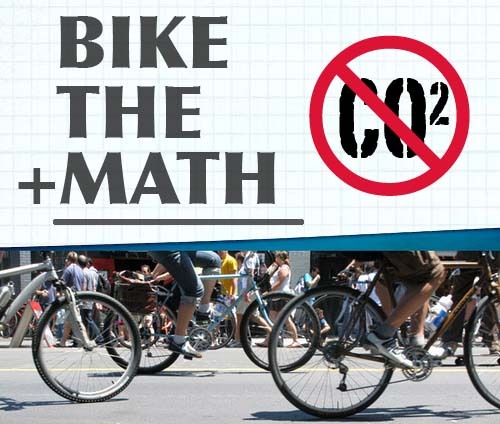 Bike the Math to Chevron’s shareholders at their Annual General Meeting in San Ramon. Let’s tell Chevron to stop fueling climate chaos and become a renewable energy company! It’s easy to despair these days. If the terrifying math of global warming hasn’t put you in a paralyzing funk, the imminent Arctic ice death spiral surely will. The numbers are daunting — 350 parts per million is what climate scientists say is the safe upper limit for CO2 in our atmosphere, and this month levels surpassed 400 parts per million for the first time in human history. The numbers, frankly, are very overwhelming, and coping mechanisms can range from screaming into the computer screen to throwing your hands up in the air and tuning out altogether. 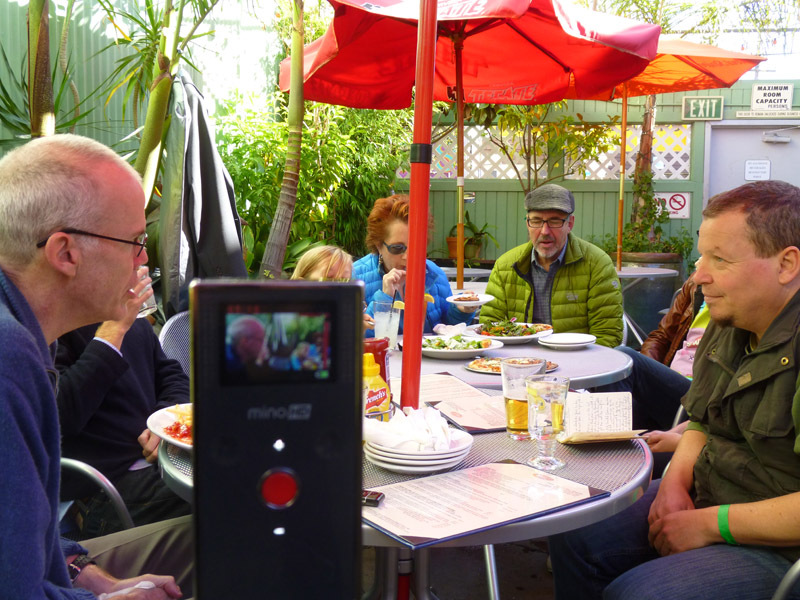 When I interviewed Bill McKibben on his Do the Math tour last November, I thought my main contribution to the Herculean efforts to get us all collectively off the dangerous fossil-fueled path was to keep writing about possible solutions, highlighting the many ongoing efforts, from renewable energy developments to zero waste to simple living to sustainable urban design ideas. It’s not that I will stop doing that, but talking to Bill made me realize that I had to step up my game. I needed to get out of my comfort zone, defy myself, and take a stand, because if we’re serious about making the big changes needed to keep this planet from frying, the one thing we cannot do is stay the same, both in our heads and in the world. When somebody asked in the Q&A after his Do the Math talk what we in the Bay Area could do specifically to stop or at least slow the fossil madness, Bill encouraged people to pressure their universities and cities to divest from fossil fuel companies, which is now happening all over the country. It was the next thing he said, however, that made a lightbulb go off in my head. “You should all go to Chevron’s shareholder meeting in San Ramon and tell them to become an energy company instead of an oil company” made a lot of sense to me. However, I thought we could really drive home the point if a bunch of people rode in on their bicycles to relay that message. 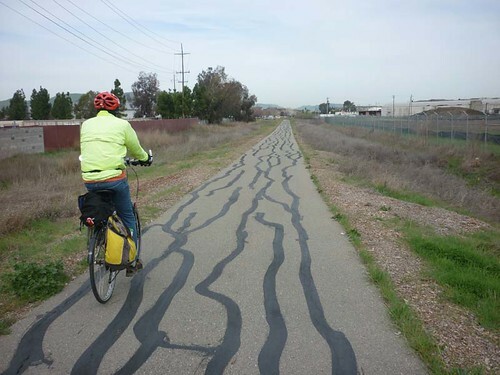 Why not bike the math to Chevron, I thought. I mentioned the Bike the Math idea at the very end of my post, and a day later Janet Stromberg from 350BayArea.org invited me to come to their general meeting. Turns out they had just formed a Chevron Watch campaign and the folks running it thought biking the math to the annual general meeting was a really good idea. We started meeting at the office of the Richmond Progressive Alliance, a group that has been fighting Chevron for years over their dirty refinery that is polluting local communities. Next, groups like West County Toxics Coalition, Communities for a Better Environment, and Asian Pacific Environmental Network (who graciously provided another meeting space) joined. 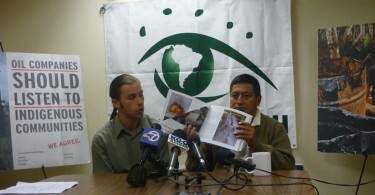 Things really took shape when Adam Zuckerman and Paul Paz y Miño of Amazon Watch, a group that has been arranging for members of indigenous communities in Ecuador to speak at Chevron shareholder meetings for years, joined our meetings. They told us what goes on inside the shareholder meeting and what to expect outside, welcoming our efforts to draw attention to Chevron’s irresponsible business practices and lend moral support for shareholders willing to speak out. More recently, we found out that groups as diverse as U.S. PIRG, Common Dreams and Tri-Valley Moveon are planning to be there, bringing attention to Chevron’s $2.5 million contribution to the Congressional Leadership Fund and promoting the Green Century resolution directing Chevron to refrain from spending corporate funds to influence electoral politics in the wake of Citizens United. In a way, Chevron represents all that is wrong with our economic, political, social, business, environmental philosophies, but I think there are some upsides to that. For one, it reminds us how all those things are connected and it speaks to the same larger imbalance and injustice within which these corporations are allowed to thrive, offering an opportunity for a larger movement to grow around the various issues. Even more importantly, it shows that the solutions are interrelated. If Chevron were to shift its business towards renewable energy, it wouldn’t have to drill in fragile ecosystems near indigenous communities or refine ever more oil in aging refineries. Likewise, if Chevron were to become a Benefit Corporation, it would care about the above, plus take the investment bubble in fossil fuels seriously and heed reports suggesting that markets are now overlooking the risk of unburnable carbon. Rex Tillerson, CEO ExxonMobil: No. My philosophy is to make money. If I can drill and make money, then that’s what I want to do. For us, it’s about making quality investments for our shareholders. And it’s not a quality investment if you can’t manage the risk around it. But I do know what the solutions are and that they’re 100% reachable, so if enough of us start speaking out and pushing the ones stuck in the old patterns to do what’s right, then I think we have a fighting chance to change the entire paradigm. 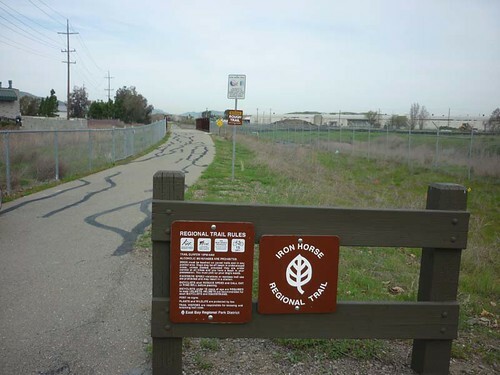 That’s why I’ll be Biking the Math to Chevron on May 29th, and I hope you will join me. 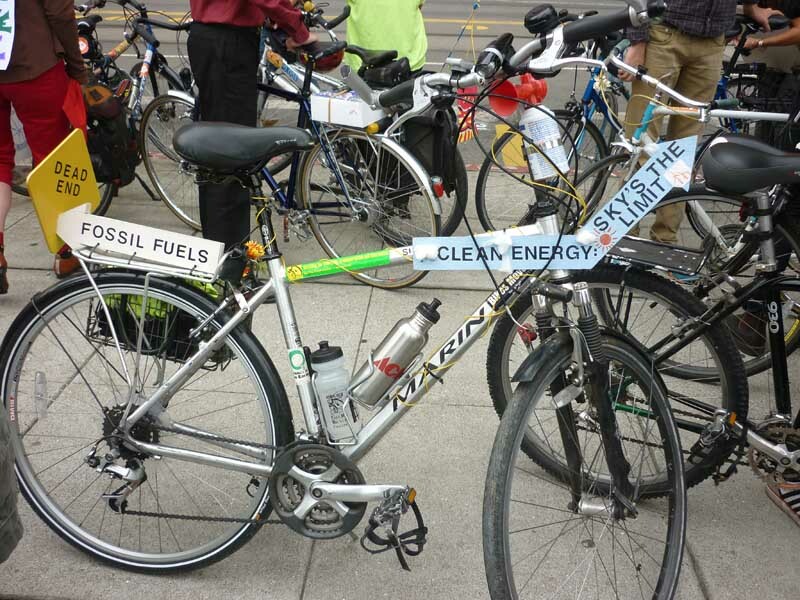 Bay Area cyclists will be riding to Chevron’s Annual General Meeting in San Ramon on May 29th to send renewable message to shareholders. 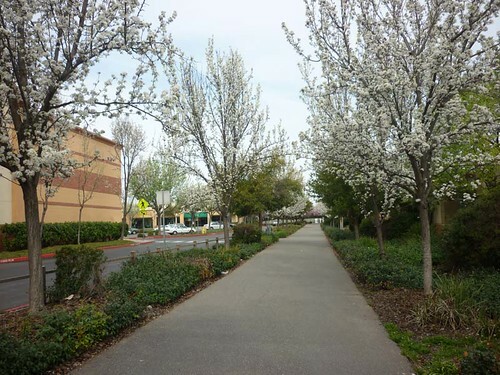 San Ramon, California – Cyclists alarmed by the terrifying math of climate change will be riding from the Pleasanton BART station (8am) along the Iron Horse Trail to Chevron Headquarters in San Ramon (9am) on Wednesday, May 29th to tell one of the world’s biggest oil companies to stop fueling climate chaos and become a renewable energy company. 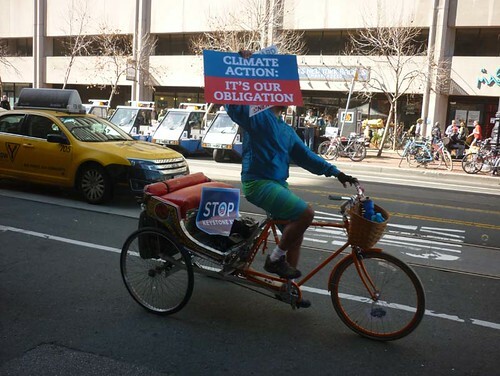 Riders from across the Bay Area will express their support of shareholders willing to speak out against Chevron’s irresponsible business practices that are destroying communities around the world and destabilizing the planet’s climate and ecosystems. Inspired by 350.org founder Bill McKibben’s Do the Math tour last fall, Bike the Math is based on the simple but shocking calculation that fossil fuel corporations have more than five times as much oil stored in their reserves as the amount that can be burned without risking catastrophe for life on earth. 350 parts per million is what climate scientists say is the safe upper limit for CO2 in our atmosphere, and this month levels surpassed 400 parts per million for the first time in human history. 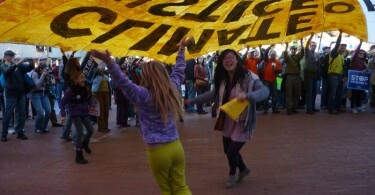 Eberlein found many like-minded citizens at 350BayArea.org — a recently formed group that is part of the global 350.org network. The group’s Chevron Watch campaign is dedicated to supporting local and international communities — from Richmond, CA to Brazil, Ecuador, Nigeria, Angola, and Texas — who are no longer willing to pay the price for Chevron’s profits. Bike the Math attempts to make the connection between rising CO2 levels, resource depletion, and the true cost of Chevron’s operations on the most vulnerable places and communities on earth, bringing together groups as diverse as the Richmond Progressive Alliance, Amazon Watch, Asian Pacific Environmental Network, West County Toxic Coalition, and Communities for a Better Environment. With leading economists warning that the world could be heading for a major economic crisis as stock markets inflate an investment bubble in fossil fuels to the tune of trillions of dollars, shifting operations toward renewable sources of energy as quickly as possible is not only the right thing to do for the climate, but for Chevron’s long-term economic viability. Hundreds of Bay Area bicyclists are poised to pedal that message to the company’s shareholders on May 29th.